The answer he gave me, as we sipped coffee together in the Hollywood Brown Derby, amounted to an entire interview–and a fascinating one at that! “I don’t like beauty,” was his startling reply, “in itself,” he qualified. 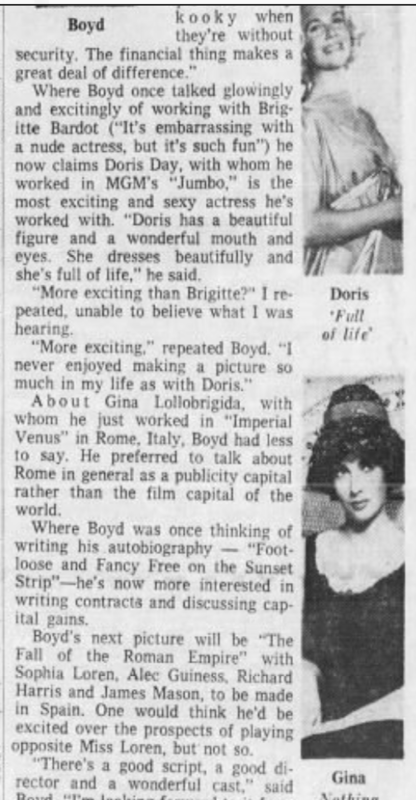 The never-to-be-forgotten ‘Messala’ in ‘Ben Hur’ and Doris Day’s current co-star in M-G-M’s ‘Jumbo’ explained. “I prefer women who are attractive to women who are merely beautiful. Beauty is not enough. “It’s not something you put on, like make-up. but if wearing make-up gives a women a feeling of beauty, she will be attractive. “We all need something to give us confidence. When you go into something new–applying for a job, for instance – to cope with the situation better don’t you wear something that has always made you feel comfortable? “Everything that you have experienced, if you use it to you benefit, makes you more attractive. This applies especially to women, who have a deeper sense of experience. Stephen agreed that both inner and outer attractiveness take work. Testimony to the latter is his marvelous physique. “The movies I do keep me fit,” he said, “I got more exercise playing a trapeze artist in ‘Jumbo’ than I’d gotten all my life. I spent two months learning to do trapeze work and tightrope walking. An I’m certain that Stephen has never looked better! 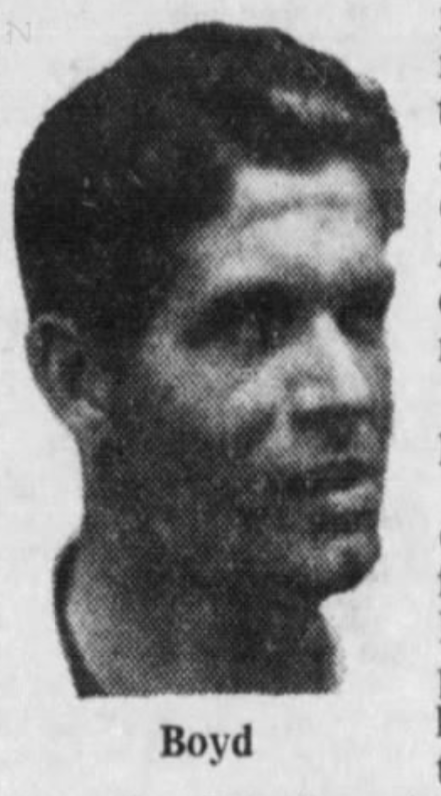 This is the second interview by Joe Hyams of Stephen Boyd. 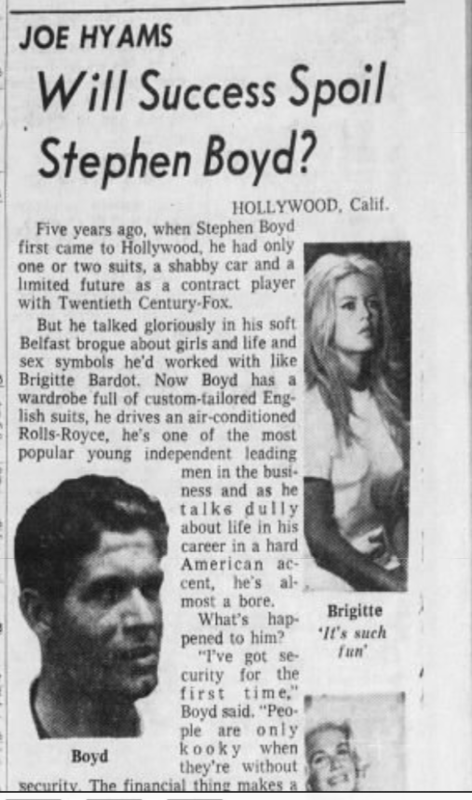 Apparently Joe Hyams found Stephen to be “a bore” in this interview, which only happened two years after the first one (see https://stephenboydblog.wordpress.com/2017/01/08/good-at-research-stephen-boyd-serious-in-romantic-ventures-by-joe-hyams-interview-from-1960/). In my opinion, however, Boyd hasn’t changed, as Joe Hyams seems to think. By this point in his career, Stephen has more to lose, and so obviously he’s taking things very seriously. Or maybe Stephen didn’t feel like turning up the Irish charm for this conversation or giving any tabloid fodder to Hyams! 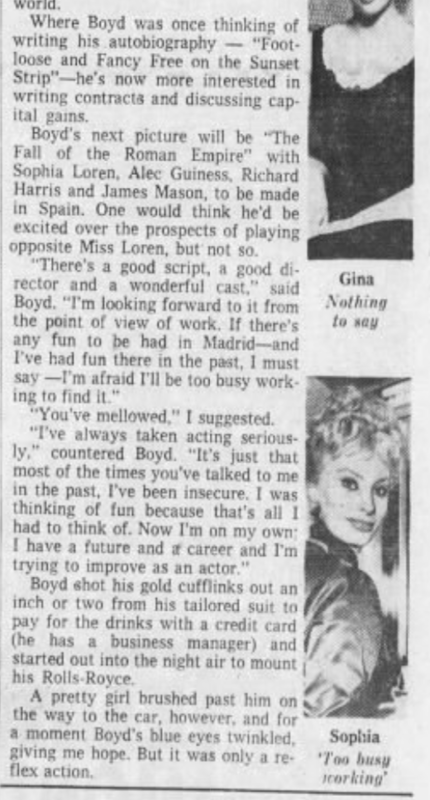 Anyway, in this interview Stephen talks about his financial security, and praises the acting ability (and figure) of his most recent co-star Doris Day. Stephen had also just completed filming “Imperial Venus” in Italy with Gina Lollobrigida and was just about to start the filming of “The Fall of the Roman Empire” in Spain.